Powder Post Beetles are one of those things you don't wish on anybody, but infestations do happen and more often than I, as a pest control specialist, would wish. Why is this Powder Post Beetle Infestation Happening to Me? The most common reason for this problem is the use of wood that was not properly cured. During the boom of the '80's and the use of hardwood that was not properly cured has cause many headaches, not to mention the heartaches and empty wallets even to this very day. After so many years? Yes, the reason is because the larvae can stay inactive for many, many years until the environment, mostly due to humidity is ideal. A lot of this activity is often unseen since it happens behind drywall, other walls, crawlspaces, etc. 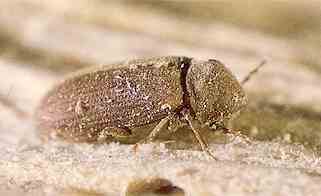 Powder Post Beetles attack hardwoods for the most part, but softwoods are susceptible as well. Here are some woods that are most commonly attacked. Let's list the highly susceptible hardwoods first. etc. Many of the lighter-colored, etc.) are highly susceptible to lyctid(check this word on the book, not correct) attack. The first thing you'll is untreated and unfinished wood. Second, you'll need ideal conditions like they almost always exist in basements, crawl spaces or near utility sheds, barns, etc. In all these high moisture in the air (humidity) is usually above 12%, add to this the dampness and almost undisturbed conditions and you have an ideal place not only for powder post beetles but for almost any other bug to have a comfortable home. Powder post beetles, however, don't need exposed wood to start feasting on it but if you see it finish it. As I mentioned above, they can be inactive for years then all of a sudden you have an infestation. Reducing favorable conditions can keep them inactive, even if they are present in your wood! Since you are not likely to see the beetles themselves I won't waste your time giving you a description of them. Suffice it say they are black to brownish in color and are almost always identified by the heavy and severe damage they leave behind. The wood is mostly a powdery post (hence the name) or mass with only a thin sort of shell (usually the outside of the piece) which has been perforated with small holes (exit holes). These exit holes are the only evidence you'll readily see that will allow you to identify them. Immediately under the whole you'll find some powder from the wood they destroyed called frass. 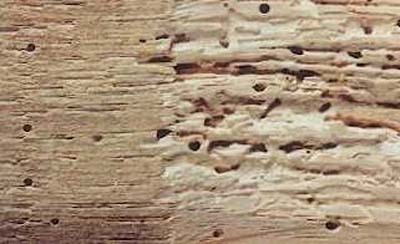 After you are sure you powder post beetles are eating your wood there are several things you must know before you start any remedy. Regardless of where it came from. 1. The first thing you need to know that the success chances you (as a do-it-yourself type of person) have are indeed very low. We can pretty safely assume that you will not be able to take care of the problem without the help of reputable pest control professional who is experienced and has been successful in controlling this pest before. Talk to people you trust and listen to their advise. 2. The advise given here is only an outline of what I have done that's resulted in successful removal but even if you follow my advise to a T, your chances are still very low. Seek advise please! 3. If you make a mistake it could end up costing you big money, seek advise. You obviously understand by now that bare wood is an immediate magnet for powder post beetles and must be treated and covered asap. Paint it, wax it or otherwise finish the exposed areas. A lot of times these beetle lay eggs in their own exit holes, so make sure you seal every hole on every bare piece of wood then cover it. Be sure to inspect it prior to working on it, seal all holes. If you trap eggs in it you are only spinning your wheels. If you want to be sure there's no threat read below for use of insecticides and temperature treatment. If you happen to read other pages on this website you will notice the one common denominator between all, CLEANLINESS. There's a big chance that your problem was simply brought into your property or let in without even knowing. Seal everything you can in your house, cracks, crevices, etc. Also the use of tightly fit screens and window and doors sills. The point, seal your house from invasions of bugs. if you keep your home's moisture content below 15% there's a pretty good chance you'll keep this pest inactive. Even if the eggs are present, they will be unable to hatch in moisture below 15%, shoot for 11% if you can! You are going to have to rely on your heating and air conditioning system, don't worry, they usually are all you need. But for spaces where no air will ever reach and humidity is above 15%, consider installing a vapor/moisture barrier, dehumidifiers, etc. Third, Ventilation. Moisture is usually higher where there is poor ventilation. If you have the means or can make the means to store small items in a subzero temperature for 48 hours you'll be able to eliminate this pest problem. If you have a minor infestation all you have to do is replace the wood with new pieces that have been properly cured. Cured wood is the key. Boron-Based Liquid Insecticide Injection and Spraying. Use a boron-based product like Bora-Care or Tim-Bor, injected and apply to the surface of the wood in order to kill some of the larvae and prevent re-infestation. Go through every squre inch of your home repeating the process described above. Crawl into every damp place, injecting and spraying every piece of wood you find. Now move to the outside of the property and spray the foundation. This method will be most effective at first contact not to mention that pyrethroid is great for pressure injection. Know what you are doing, please! If you are not careful your chances of messing something up are much higher than those of controlling your powder post beetles problem. But if you take heed and seek advise from those who are experienced you'll save big money and reclaim your home once more!